Esther Kim was a music teacher at a Christian school in Korea (now modern day North Korea). The year was 1939. On the first of the month the Japanese oppressors demanded that the Korean students and teachers go up a mountian where they would be forced to bow and worship the sun-goddess. Even Esther's principal, a Christian herself, demanded that Esther make sure she was there and that she bowed as well. If they didn't all go, the Japanese would close the school. As the children and teachers made the climb, Esther was praying silently and asking the Lord what she should do. She didn't want to bow, but she knew that all her other Christian friends would obey the Japanese because they didn't want to get in trouble. The time came. A loud voice announced, "Our profoundest bow to Amaterasu Omikami [the sun-goddess]." Instantly, the entire crowd bowed as one. All except for one small figure. She kept herself erect, boldly defying the order to bow at the shrine. She lifted her face to the sky and prayed to Jesus. Esther felt immense peace as she defied the order to worship an idol and knew in her heart that what she had done was right, even when all her fellow teachers (who were believers) bowed. Esther didn't know the outcome of her refusal, but she knew she was in God's hands. She was later summoned to the police station and questioned, but managed to escape. She spent several months on the run, going from one town to the next. She was then caught and thrown into a Japanese prison, where she would spend six years (1939-1945). Before entering prison, Esther had memorized over 100 chapters of the precious Word and was therefore well-prepared for ministry there. She won many of her fellow prisoners to Christ and was a shining example of His love even in the midst of torture and unthinkable conditions. Because of her example, the Japanese actually reduced the amount of torture they put upon their prisoners. After being released from prison in 1945, Esther met Don Kim and they were later married. The Kims toured the United States, sharing Esther's testimony. She and her husband later founded Berendo Street Baptist Church in Los Angeles in 1957 and their legacy of faith continues to this day. Esther wrote about her time in Korea, "I was only an ordinary woman. No kingdom was awaiting my rule. Still, I knew that my Lord had ordered me to fight. I had no choice except to bear testimony of my Savior until I should die." 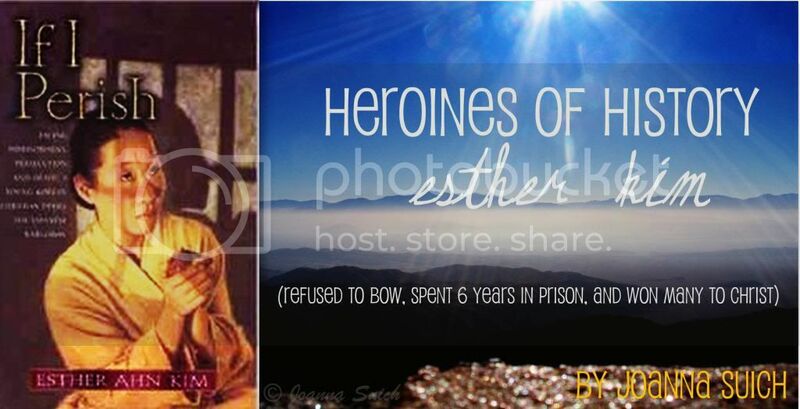 To learn more about Esther, read her autobiography If I Perish. Whoa, that is just amazing. I put a request in for the book at the library, thanks!